Some time ago, I received Uriélle Revitál a luxury hair care treatment for review. I love trying new products on my hair, so I was very excited to try it out and curious about results. I didn't expect anything... spectacular ;) How wrong I was! "Using all natural extracts, Uriélle Revitál-Treatment is rich in vitamins, antioxidants, and fatty acids that strengthen hair and increase elasticity. Amla (Emblica officinalis) extract, a key nourishing component, is plentiful in amino acids and vitamins such as Ascorbic acid, Thiamin, Riboflavin, and Niacin, all essential for truly healthy strands. 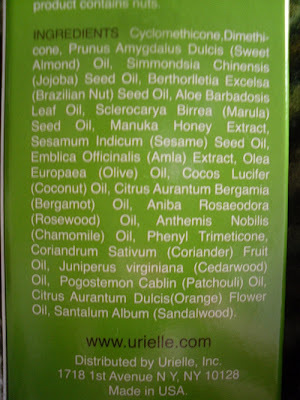 Marula (Sclerocarya birrea) seed oil contains essential fatty acids and beneficial antioxidants. The Tsonga people of South Africa and Mozambique are wise to its benefits and have used it as a natural moisturizing body lotion and massage oil for many generations. Brazil nut (Bertholletia excelsa seed) oil, Olive (Olea europaea) oil and Jojoba (Simmondsia chinensis) seed oil make Uriélle Revitál-Treatment abundant in thirst-quenching moisture and soothing hair-conditioning agents. Derived from the nectar of the flowers that grow on the Manuka (Leptospermum scoparium) plant, Manuka honey extract, a vital ingredient in Uriélle Revitál-Treatment, is a remarkable gift from nature that is indigenous to New Zealand. Honey, in general, is one of the oldest medicines known to man, with proof of its healing power dating back more than 5000 years. Clinical observations and experimental studies have established that honey has effective antibacterial and anti-inflammatory properties. Today it is gaining notice and new credibility with current medical and scientific communities. According to specific studies at New Zealand’s University of Waikato, Manuka honey offers more valuable healing properties than any other honey in the world. A derivative of silica, Phenyl Trimethicone enhances the appearance and feel of hair by increasing body, suppleness, and sheen, improving the texture of strands that have been damaged physically or by chemical treatment. Ultra lightweight silicone oils (Cyclomethicone, Dimethicone) work to detangle hair improving comb-ability and providing softness while Sweet Almond (Prunus amygdalus dulcis) oil imparts a silky, healthy-looking luster. 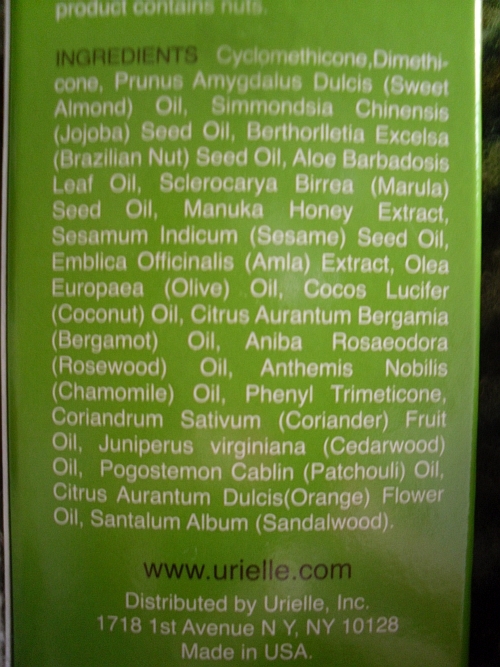 Uriélle Revitál-Treatment can be used on all hair types including color, chemical, and keratin treated hair. Even healthy hair shows noticeable improvement. Free from parabens, sulfates, propylene, glycol, DEA, TEA or synthetic color or dyes Uriélle Revitál-Treatment is never tested on animals." When I first receive this product, the list of ingredients on the back really got my attention. There were so many different natural oils and extracts and no parabens or other toxic stuff, that I knew that this product will work amazing on my hair, but didn't expect the result after only one use (!). After I've washed my hair, I massaged two drops of Uriélle Revitál-Treatment into my damp hair and blow dry as usual. I noticed change right away - amazing SOFTNESS. I have thick, long hair and I use hot tools a lot, so my hair has tendency to get really dry. This product made it so soft and easy to style. Even my fiance couldn't stop touching my hair, lol. This treatment doesn't belong to the cheapest products ($45 for one bottle), but if you will consider how many amazing ingredients you get in one product, it's worth the price. 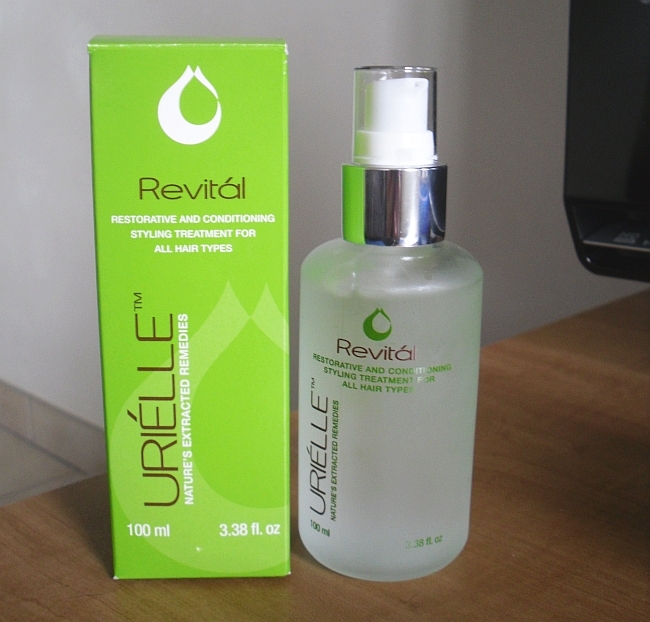 Uriélle Revitál-Treatment contains 100ml, so it should last for really long time. I am definitely getting another bottle! Enter below. Contest open till 7th May 2012! Wow really a great review.